This is an inspiring book. It covers the history of street art dating back to the renaissance period, and provides lots of references to how street art are adopted by people all over the world. There are lots of great photos of his trips and work from the 80s to today. 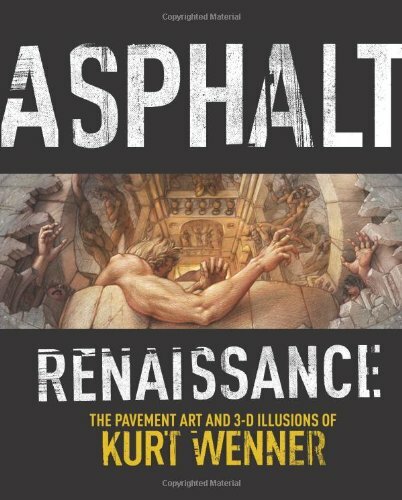 Kurt Wenner's journey in art and street painting is fascinating. He has been painting for more than 25 years, and the book collects the many interesting stories that are a joy to read. He started out as a struggling artist. His art professors claimed he had no talent. He thought otherwise and traveled to Rome to spend his days drawing in museums, to the point that the guards know him so well and became his fans. He became real good at art, and the book features some of his amazing sketches. After that, the stories are about how he traveled across European countries trying to make a living off street paintings. He talks about the different things he learned in each country, people's preference for art, the laws governing street art, his interaction with the locals, making his own chalk and more. He even hired homeless people to look over his street paintings. Some had memorized Wenner's usual lines that they were able to give talks on art history themselves. Street painting is not easy, and that's a constant underlying theme throughout the book. He had to draw with unpredictable weather, or draw onto burning asphalt during a competition. Once, he had to sleep in open air beside a gas station because he had no money. All these just make the stories more inspiring. Kurt Wenner's story is a truly absorbing and uplifting read.